Food tours are an excellent way of finding the local delicacies and the little out-of-the-way places that make the best versions of them. They’re also great for presenting things that you wouldn’t ordinarily try, such as the prawn cakes made from whole prawns that we enjoyed so much in Vietnam that we went back for seconds when Jo came out to join us! 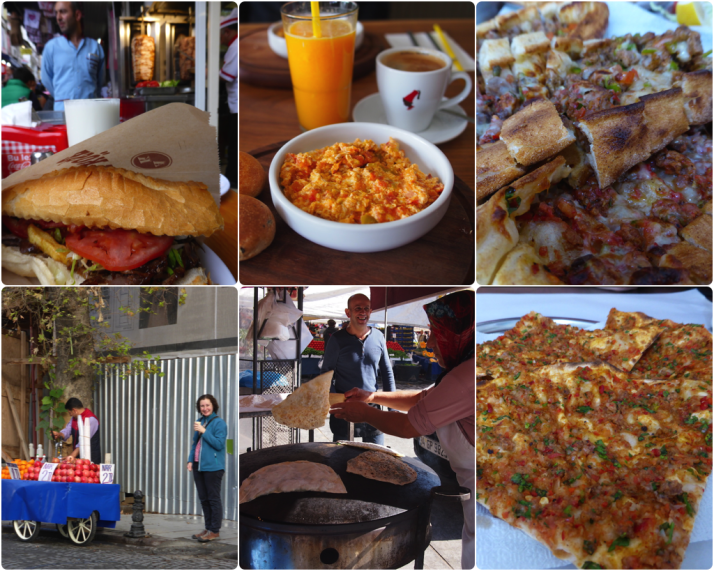 As we knew we’d be spending a bit of time in Istanbul, we looked for a street food tour but were quickly put off by the prices – some as high as $145 USD, about £92 GBP. Each. Yes, this is a big, bustling city but we didn’t want to pay big city prices. A little bit of research later and I had compiled a list of foods to look out for while we strolled around. Here then, is our list of what to try and where to find it presented in a vaguely sensible order that has been curated over the course of weeks, and could be tackled in a day or so depending on your appetite..
First though, a quick summary of what you’re about to eat, and how much (roughly) it’ll cost. The best way to start the day with the one-two punch of strong coffee and sweet, sweet baklava – a small Turkish dessert made of pastry, nuts and soaked in honey! Starting in Eminönü, in the square outside the Yeni Cami and the Spice Bazaar, keep the Spice Bazaar on your left as you walk up the right-hand side of it, then take your first right up a small alley – there’s a very busy coffee shop that sells fantastic freshly ground Turkish coffee on the corner (we’ll be back this way soon, so you can try it first and buy some on the way back). After about 150 metres look out for the green neon of Develi Baklava, a little coffee shop with astroturf and two little tables outside. 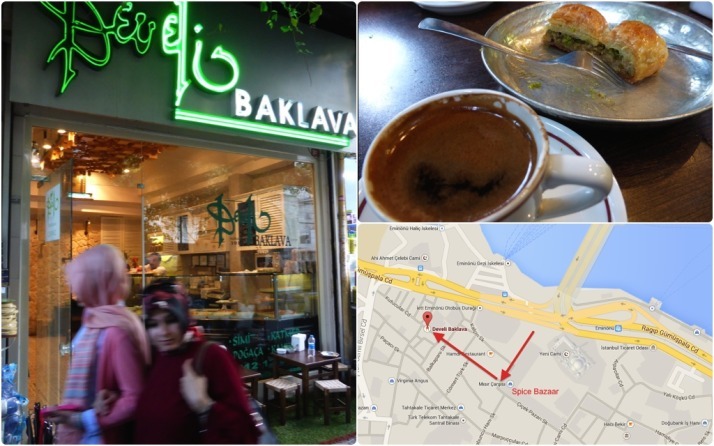 Pop in and choose 2 or 3 different baklava from the counter to go with your Turkish coffee. Try to grab one of the outside tables as this alley is great for people watching. We’re in Turkey, so we are obligated to try the other sweet they’re internationally famous for, Lokum or Turkish Delight. Head back towards the Spice Bazaar, stopping for a take-away bag of ground coffee from the shop on the right-hand corner if you wish. The Spice Bazaar is a big ‘L’ shape, so follow it along stopping to sample the nuts and dried fruits or smell the spices, teas and soaps, and exit from the long end, near the back of Yeni Cami. Time for breakfast! Borek is a traditional Turkish dish that consists of layers of pastry and cheese, a bit like a light cheese-only lasagne. And it’s a great as it sounds! Exiting from the Spice Bazaar, turn left and you’ll see Yeni Cami again. When you reach it, turn right past the Sultan’s entrance (the long ramp up the rear of the mosque) then take the next left. 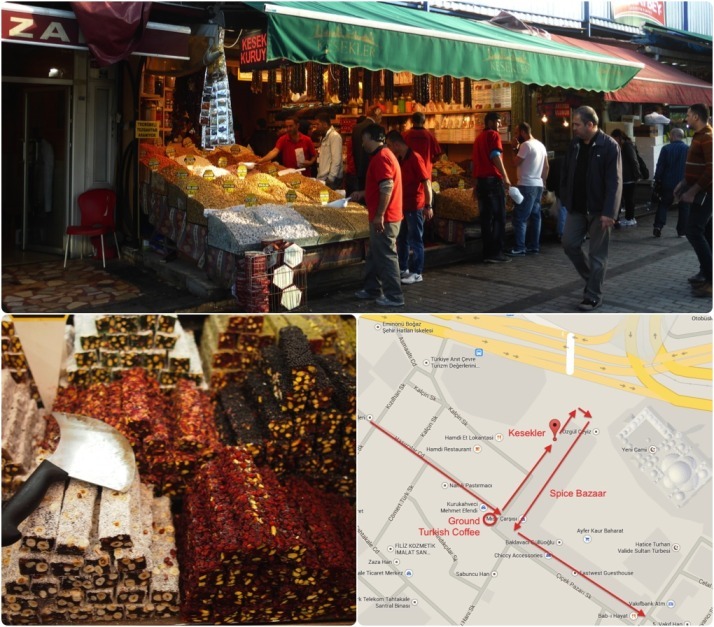 Follow ‘Arpacilar Caddesi’ round to the left then look out for the red sun-shade of ‘Sariyer Borekcisi’ (No 10). Pop in and order borek and çay (pronounced “chai” – tea!). The tea is served quite differently to other countries we’ve visited. Here it’s served in a small handle-less glass cup, without milk and is very strong. We rarely managed a glass without adding sugar and we like strong flavours! 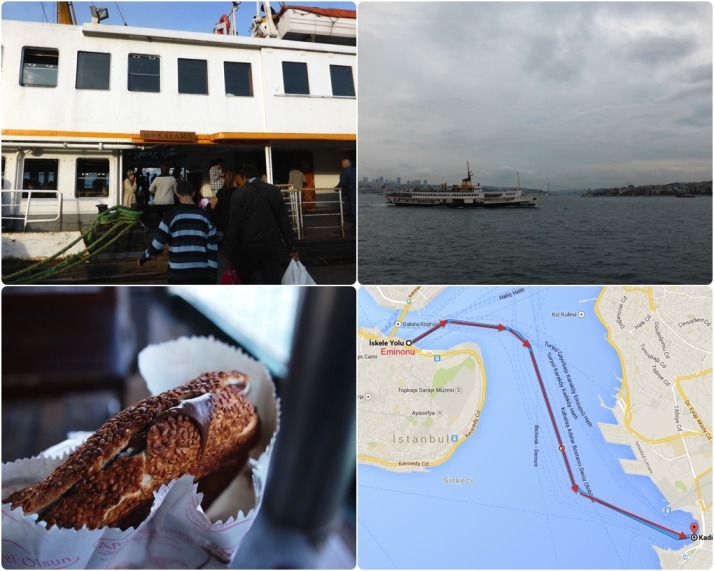 Do as the İstanbullu do and sip çay while reading the newspaper or catching up on email and Facebook as you cruise across the Bosphorus to the Asian side of the city. 15 metres further along Arpacilar Cadesi and you’ll be at Eminönü tram station. Use the crossing to your left to cross the road, the tramlines and the road again until you’re at the water’s edge and look for the ferry terminal to Kadiköy – it’s the one on your right with Kadiköy written on it. If you’re still a little hungry, pick up a simit for the journey – they’re a small, crispy, round bread covered in sesame seeds. For another Lira you can have it filled with Nutella! 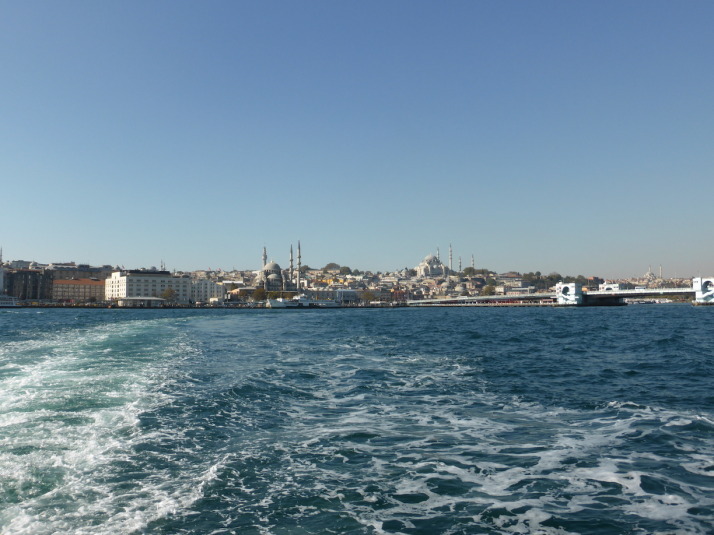 The ferry to Kadiköy takes about 25 minutes. Time for a spot of lunch and one of our favourites: Balik Ekmek literally “fish bread” or fish sandwich, washed down with the traditional accompaniment of turnip juice. Yum! The fish is pan-fried mackerel, and does contain some bones. There’s always room for ice cream, and Turkish ice cream is some of the best in the world – thick, creamy, and intensely flavoured. Watch your step as you leave Albatross, continue up ‘Hasirci Başi Caddesi’ and take the first right – not the first small turning, the one with the corner shop on the corner of ‘Süleyman Paşa Sokaği’. Walk uphill until you reach the tram tracks on the cobbled street, cross them and the road, and you’re on the top of the hill. Immediately to your right, the 2nd shop along is our destination. The scoops are small, which is enough of an excuse to order two. I’d suggest two scoops of chocolate unless another flavour takes your fancy! Lunch isn’t over yet, it’s time for another Istanbul speciality – Kokoreç (pronounced ‘kokoretch’) washed down with ayran. If you’re reaching bursting point, maybe get one to share or ask for a taste. 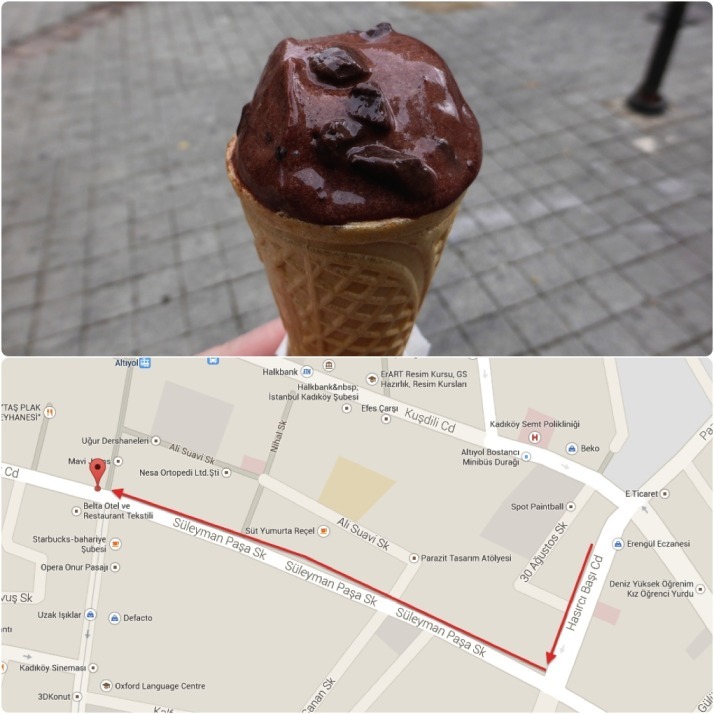 Continue downhill on the same street, and at about the point where you run out ice cream, you’ll find ‘Kokoretto’ on your right. Kokoreç is cooked outside like a kebab, but it’s horizontal as opposed to vertical, and cooked over charcoal. Ayran is a great accompaniment, it’s a light yoghurt drink, similar to Indian Lassi, though it’s not as sweet. What is Kokoreç, you ask? Hmm.. I think I’ll tell you after you’ve eaten it. All you need to know now is that it’s tasty! This next area doesn’t involve eating, though you’re welcome to sample or take some home for later, in fact, it would surprise us if you didn’t! Staying on the same downhill street, keep going as it twists a little left then a little right until you cross the road into the steeper, narrower pedestrian (and occasional scooter) alleyways of the old Kadiköy market area. The clothes and mobile phone shops are replaced by cafes and wholesale dried goods, and at the next junction you’ll be surrounded by fresh fishmongers – we’ll call this fishmonger junction for future reference. There are a few delicatessens on the perpendicular street – ‘Güneşli Bahçe Sokaği’, so pick a direction (either left or right) and pop into one or two for a good look around. One of our favourite things to do is buy 5 or 6 different dishes and a fresh baguette to create our very own Istanbul meze dinner – great if you’re staying in an apartment or for a picnic in one of the city’s many parks or a trip to the Princes’ Islands. 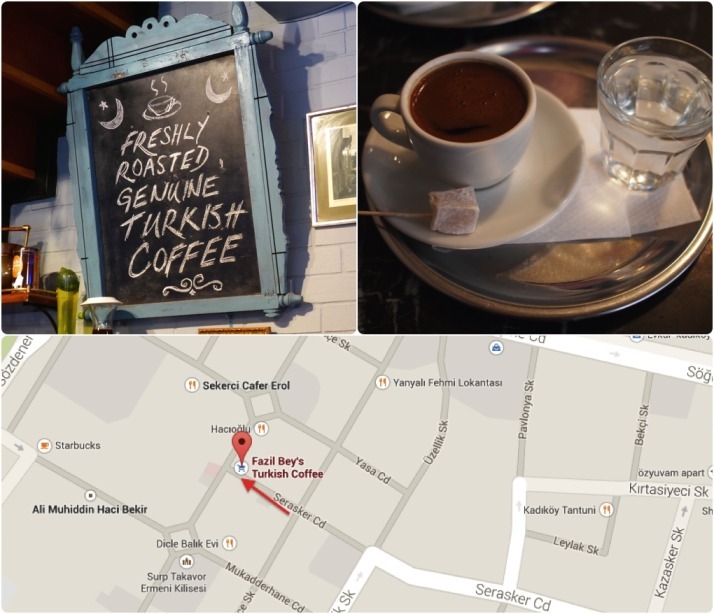 There are plenty of little cafes in this narrow, compact area of Kadiköy, and the most famous of them is Fazil Bey where we’ll soak up the cafe culture until we find ourselves ready for a spot of dinner. Return to the fishmonger junction, and turn downhill along ‘Serasker Caddesi’ from the smells of fresh produce to the smells of freshly ground coffee. 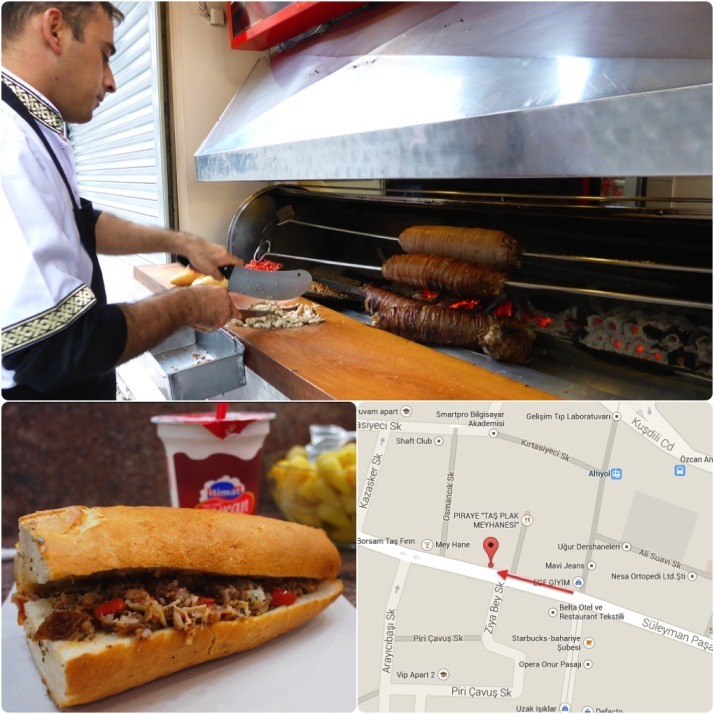 Fazil Bey is just before the next junction on your right, find a seat and you’ll be presented with a menu. Kadiköy: Dinnertime – Meat or Fish? It’s eating time again! There are two very good restaurants just around the corner, one ‘Kadi Nimet Balikçilik‘ specialises in fish and the other, ‘Çiya Sofrasi‘ (pronounced ‘Chiya Sofrasi’) specialises in family recipes from around Turkey and is where a few of the guided food tours end up for dinner. We’ve eaten at both and they’re both great. 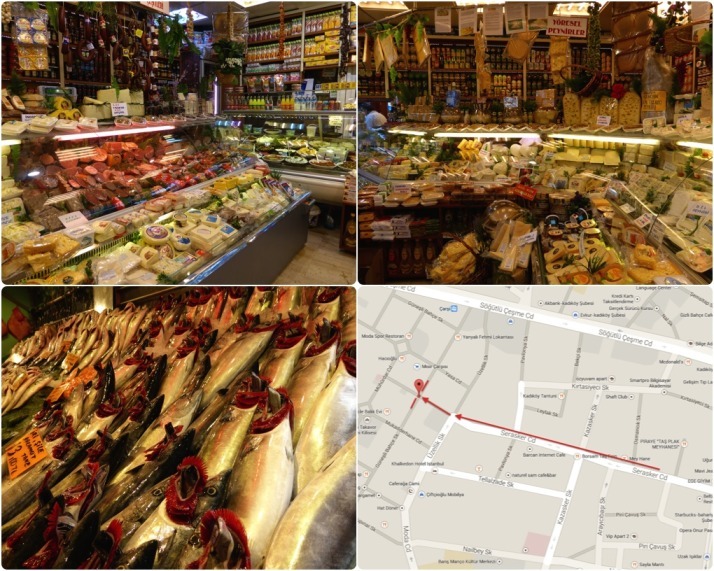 Head back up the alley to the fishmonger junction and Kadi Nimet Balikçilik is on the corner on your right. There are plenty of seats inside and upstairs though it does get very busy. I can heartily recommend the levrek dolma or stuffed sea bass meze and the stuffed mussels (pictured above) – the sea bass is amazing! Head back up the alley to the fishmonger junction and turn right down ‘Güneşli Bahçe Sokaği’, Çiya Sofrasi is about 130 metres along on your left. This place also gets busy and for very good reason. 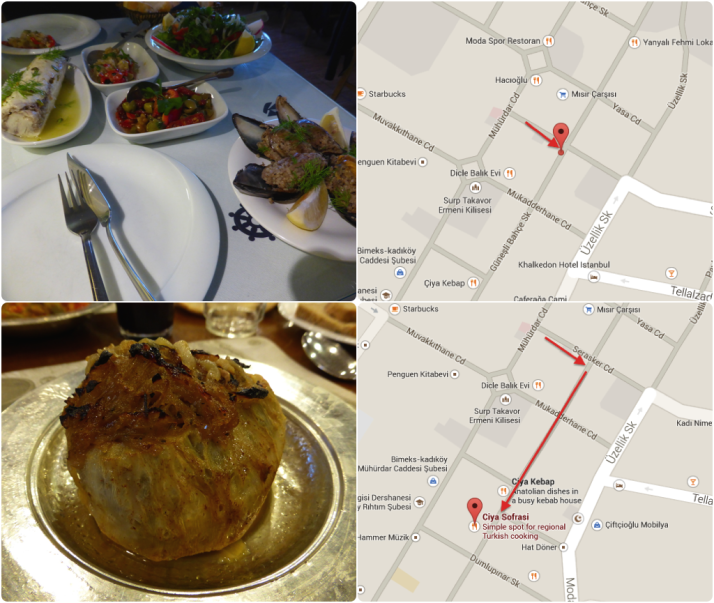 They have 3 restaurants in this street that specialise in different styles of Turkish food but Sofrasi is the one to choose. They have a great salad bar and a wide selection of vegetarian dishes. Definitely order the ‘puff lavash‘ because it sounds funny (and it’s tasty)! That’s it, do you have room for a mint? It’s only a tiny little thin one. Lahmacun – usually found alongside pide, it’s like a very thin crust pizza without the cheese, and makes a great pre-pide starter! Ahh yes, kokoreç.. if you don’t know what ‘sweetbread’ is then I suggest you maintain a state of blissful ignorance. And definitely try it before you look it up. 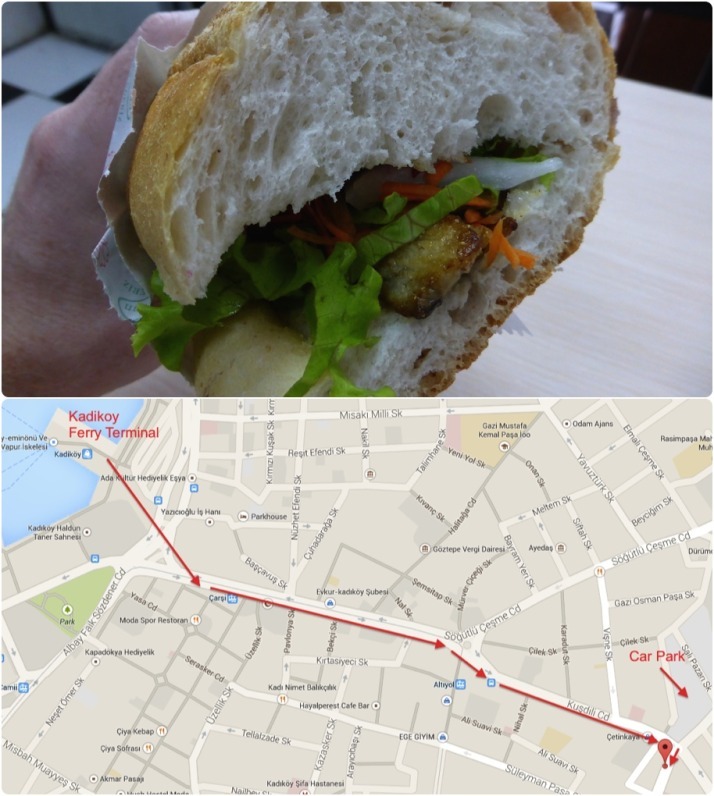 This entry was posted in Experiences, Places and tagged Food, Istanbul, Turkey on November 8, 2014 by Andrew. Now I’m hungry! Sounds like a good tour.